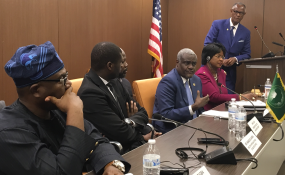 President of the Constituency for Africa (CFA) Melvin P. Foote's Remarks at the Meeting with the Chairman of the African Union H.S. Moussa Faki Mahamat, November 15, 2017, African Union Mission, Washington, DC. Good evening everybody! My name is Melvin Foote and I am the President of the Constituency for Africa (CFA). CFA is a Washington, DC based organization that works to (a) educate Americans about Africa; (b) Improve cooperation and coordination amongst various organizations, groups and businesses that work on African issues; (c) unify the African Diaspora; and (d) to work to shape United States policy towards Africa. It gives me the greatest pleasure on behalf of the Constituency for Africa and the African Diaspora, to welcome to Washington the Chairman of the African Union Commission, H.E. Moussa Faki Mahamat. We are indeed very honored and extremely pleased that the Chairman has come to Washington and agreed to meet with us Diaspora leaders. Mr. Chairman, the Diaspora in the United States and worldwide, has much to offer Africa. In the United States alone there are over 50 million who are Diaspora. This includes African-Americans, whose ancestors were brought to these shores 400 years ago as slaves, to provide the free-labor that enabled this country to develop into the power that it is today. There are also African immigrants from countries across the continent, who now rank as the best educated of all immigrant populations in this country. According to the World Bank, the African immigrant community remit more than $35 billion dollars to the continent each year, a larger amount than all of the Foreign Direct Investment that you the continent receives. There are also large numbers of Afro-Latinoes, and those from the Caribbean. There are many areas that the African Union and the Diaspora can work together and cooperate. One clear area that we can jointly work together on is increasing direct and indirect investment in Africa and on economic and business development. Mr. Chairman, you will also be pleased to know of the technological capabilities of the Diaspora in the United States in the areas of healthcare, education, business development, agriculture production, computers and science, road and infrastructure construction and in many other areas -- which if properly tapped can be a very valuable resource for Africa, as the continent addresses the growing demands of citizens and the development challenges facing the rapidly expanding next generation on the continent. Sir, if properly engaged, we in the Diaspora can also be much more helpful to Africa in the lobbying of the United States government and to ensure that Africa is dealt with in a fair and equitable manner. While we are very proud to call ourselves Americans and want very much want the United States to win. We are also very proud of our African heritage and want Mother Africa to also win! I must tell you Mr. Chairman, while we in the Diaspora have this great potential, we are also very much challenged by the lack of unity and the spirit of cooperation, amongst us. We are deeply divided, fragmented and even antagonistic towards one another. We honestly spend an inordinate amount of our time dealing with nonsensical issues like trying to determine, who is an Africa, and who is not! I guess the real question is, "Are you an African because you were born in Africa, or are you in Africa because Africa is born in you? We certainly look forward Mr. Chairman, to your clarification on the definition of African Diaspora, and how you envision that we can work together in a more unified manner. We very much look forward to hearing from you Chairman Moussa Faki Mahamat and to engage you on issues concerning Africa and the Diaspora. In addition to hearing your thoughts on a range of issues in Africa, involving economic development, democracy and governance, and social and political development -- we are especially eager to hear your thoughts Mr. Chairman on how we in the Diaspora can best work with the African Union to address and resolve issues in Africa and to work towards a more harmonious union of African people worldwide. Mr. Chairman, the African Union has sent us a great Ambassador to Washington. We are indeed very pleased with Ambassador Arikana Chihombori Quoa. She is totally committed, driven and works tirelessly. I now want to call on my good friend, the African Union's Ambassador to Washington, who will introduce the Chairman.